Well I've not been doing much cooking lately, been fighting a nasty cold instead. We had tons of filling leftover from the valentines ravioli but was in no condition to make more so thought it would be nice just tossed with some spaghetti. Made a really nice, light, easy dinner although some black olives would have been nice in this. While I found this too lemony in the ravioli it suited spaghetti really well. 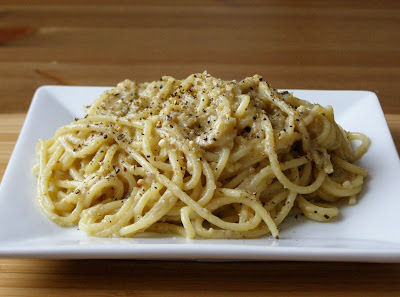 Recipe is in the valentines post below, just spoon some filling mixture over cooked pasta and stir well, about two tablespoons per person and top with loads of black pepper - it counters the lemon taste really well. If using the filling fresh you probably won't need any more liquid but I was using it chilled from the fridge and did need to add a splash of pasta cooking water until creamy. The flavors of this dish sound delicious! I'm just getting over a cold as well - tis the season. Hope you're feeling better.